Thorpe Park is a theme park located in Chertsey, Surrey, United Kingdom. It was built in 1979 on the site of a gravel pit which was partially flooded with the intention of creating a water based theme for the park. 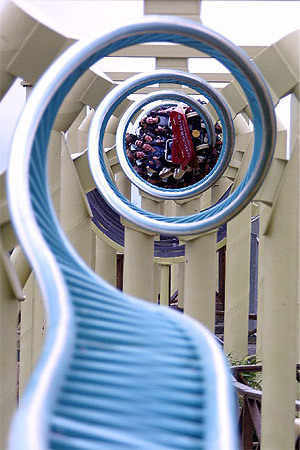 The park's first large roller coaster, Colossus, was added in 2002. In 2007, Tussauds was bought out by Merlin Entertainments, who now operate the park on a lease from Nick Leslau. Nemesis Inferno, Europe's first inverted roller coaster with interlocking corkscrews. Colossus, the world's first ten-inversion roller coaster. SAW: The Ride, the world's first horror movie themed roller coaster and the world's steepest freefall drop roller coaster. Stealth, a launched roller coaster which accelerates to 130 km/h (80 mph) in approximately 1.8 seconds. Previously held the record for the fastest roller coaster in Europe. X: No Way Out, the world's first and only backwards in the dark roller coaster. Loggers Leap, the tallest log flume in the UK from 1989–1993 and from 2005–present. In 2007, the park had 1.7 million visitors, making it the third most visited amusement/theme park in the United Kingdom, after Alton Towers and Pleasure Beach; and 13th most visited in Europe. Thorpe Park is situated on the site of a former quarry on the border between Chertsey and Egham in Surrey. Then owners Ready Mixed Concrete Limited flooded the site after the quarry's closure in the late 1970s, with the intention of opening an educational leisure park. On May 24, 1979, Thorpe Park was officially opened by Louis Mountbatten who lent his name to the Mountbatten Pavilion, a large domed structure located at the entrance to the park.At this early stage in the park's history, the complex consisted of educational exhibitions such as Model World, a collection of famous structures from around the world built in 1:36 scale, with the Mountbatten Pavilion housing a standing aircraft display. In 1998, the park was bought by The Tussauds Group, owner of Alton Towers and Chessington World of Adventures. Due to the latter's proximity to Thorpe Park, Tussauds embarked on a strategy to allow the two parks to cater to different markets: Chessington would be transformed into a family park, and Thorpe would cater to the thrill-ride market. Attractions included the Cinema, Magic Mill, Waterbus services, Model World, Railway, Teacups, Nature Trails, Phantom Phantasia, Thorpe Farm and Sunken Gardens. Thunder River water ride opened, at a cost of over £2 million. The 630 seat Palladium Theatre opened. Loggers Leap (largest log flume in the UK until 1993, and again since 2005) opened. Space Station Zero was re-themed into the Flying Fish and moved outdoors. Drive in the Country opened. Fantasy Reef area was refurbished. Mr. Monkey's Banana Ride opened. Mr Rabbit's Tropical Travels opened. Miss Hippo's Fungle Safari opened. Drive in the country closed. X: No Way Out, the world's first dark backwards roller coaster, opened. The Tussauds Group purchased the park. Pirates 4D, a 4D cinema attraction starring Leslie Nielsen, opened. Tidal Wave, a Shoot the Chute made by Hopkins Rides, opened, becoming the tallest ride in the park at that time. On July 21 a major fire broke out in the centre of the park. The fire destroyed The Wicked Witches Haunt (previously known as Fantom Fantasia) and the inside area of Mr Rabbit's Tropical Travels. The Wicked Witches Haunt was closed immediately. Mr Rabbit's Tropical Travels was reopened until the end of the 2001 season; it was then demolished to make way for the 2003 rollercoaster, Nemesis Inferno. A Huss Enterprise was drafted in as a replacement. The Lost City area was established, with the Enterprise (now rethemed and renamed Zodiac) and Vortex (a KMG Afterburner) as its first rides. Thunder River closed, ready to be revamped into Ribena Rumba Rapids for the 2002 season. Detonator, Mega Drop made by Fabbri, opened in Calypso Quay. Colossus, an Intamin roller coaster with a record-breaking 10 inversions, opened. Safari High Dive show opened for one season. Thunder River re-opened as Ribena Rumba Rapids. Debut of the park's annual Halloween event, Fright Nights. "Dino Boats" removed in the Calypso Quay area of the park. Nemesis Inferno, a Bolliger & Mabillard inverted roller coaster themed around a tropical volcano, opened. Also Quantum, a Fabbri magic carpet ride, opened. Eclipse, a Fabbri Ferris wheel, opened. A Spider- man show was performed in the arena. This continued into 2004 and was replaced in 2005 by Stuntzmania. Calgary Stampede closed to make way for Samurai from Chessington World of Adventures. Eclipse closed at the end of the season due to a lack of riders, having lasted only one season. It was moved to Chessington and was renamed 'Peeking Heights'. Samurai, a Mondial Top Scan moved from Chessington, opened. Tea Cup Twisters rethemed to 'Storm in a Tea Cup' to fit with nearby Amity Cove's theming. Flying Fish closed at the end of the season to make way for Stealth in 2006. Slammer, an S&S Sky Swat, opened on March 26, after being delayed due to technical issues. Rush, an S&S Screamin' Swing and the world's biggest air-powered speed swing (until the opening of Skyhawk at Cedar Point in the US), opened during the afternoon of 27 May. Stealth, an Intamin Accelerator Coaster which launches riders from 0–80 mph in 2.3 seconds, opened with the park on March 15. A 'Ride It First' competition was held with the lucky winners experiencing Stealth before it opened to the rest of the guests. Zodiac was replaced by another Enterprise, sourced from Drayton Manor. StreetXtreme replaced Stuntzmania in the Arena. Flying Fish returned, located between Tidal Wave and Wet Wet Wet. Thorpe Farm closed, mainly due to a lack of visitors. Canada Creek Railway reopened as a small circuit around Canada Creek, and it no longer travelled to Thorpe Farm. The railway takes a bear hunt where riders spot models of bears around the journey. Ribena's sponsorship contract ended and so 'Ribena Rumba Rapids' changed its name to 'Rumba Rapids'. The ride remained unchanged. Stealth was 'upgraded'. The ride now accelerates from 0–80 mph in 1.8 seconds; previously it had been 2.3 seconds. No show was hosted in the Arena, although the Se7en scare maze was still hosted there in Fright Nights. The park started opening for February half term; in previous years the park had not opened for the season until March. During February reduced entrance fees applied, as limited rides were available. Many rides were still closed for winter maintenance. X: No Way Out was slightly refurbished, with a new storyline added about how 'X Laboratories Facility' lost control of their super-computer, thus sending riders into the strange and disorientating ride. Also, robot dummies and new lighting were added to the queue line and ride. New 4D Cinema film "Time Voyagers" opened to replace "Pirates 4D". It was announced that Canada Creek Railway would not run for the whole season due to construction of SAW: The Ride. The arena was once again used for shows this season after having not been used the previous season. SAW - The Ride, a custom Gerstlauer Euro-fighter rollercoaster opened. Canada Creek Railway re-opened with an altered route. Miss Hippo's Fungle Safari closed. Fast track for Rumba Rapids. Thorpe Blast was due to return but was cancelled in August. SAW Alive is added to the park. This is the park's second permanent SAW attraction after SAW - The Ride and its first permanent horror maze. (The park operates four temporary horror mazes during its Halloween Fright Night event). Two new restaurants - Desperados Mexican cantina and The Coffee shack. Entrance and various fences and buildings around the park painted into the new brand guided colours. How to get to Thorpe Park ? We're just 20 miles from central London, with plenty of great transport links. Check all the details below so you can work out the quickest route from to the Nation's Thrill Capital! Using GPS? Use KT16 8PN to find us. You can also see a Larger Map. THORPE PARK is within easy reach of London. From the M25 take junctions 11 or 13* and follow A320 to THORPE PARK. If you require detailed directions we recommend using the Transport Direct free on-line Route Planner. This service provides a map and detailed direction traffic news via e-mail on the day of your trip. Simply follow the Transport Direct link below, fill in your postcode and ours, which is KT16 8PN and away you go. Before you travel, check out the very latest travel news at the Highways Agency, or use the Transport Direct Route Planner. Regular South West Trains run from Waterloo direct to Staines. The 950 shuttle link operates from Staines station to the Park running every half hour. Trains also run regularly from Reading and Guildford to Staines Station. Call 08457 48 49 50 for Network Railtimetables. Also visit South West Trainsfor details on getting to THORPE PARK. Staines Bus station is a 5 minute walk from the railway station. Buses for THORPE PARK depart from Stand 2, however, the 950 THORPE PARK Express departs directly from Staines Railway Station. Other services operate as follows. From Woking: take the 426/446 to THORPE PARK. From Staines: take the 950/951/426/446/451/461/551 to THORPE PARK. For more information call the Traveline on 0871 200 22 33. There is a coach service from London Victoria to Staines. During the thrills of the day on the park, there’s no place better for a siesta than our brand new Mexican Cantina. Seating: Indoor and outdoor seating available. Find a delicious array of freshly prepared food for all the family at the Glasshouse Kitchen and Bar. You can relax and enjoy a meal and a drink either indoors or outside on the terrace while watching the world go by. Head to Ranger County for some freshly prepared BBQ food. Char-grilled ribs, tasty burgers, salads and jacket potatoes will hit the hunger spot. Experience great oriental food, using fresh ingredients and Amoy Noodles. Our Noodle Bar cooks-to-order each dish by using the searing effect of wok stir frying. Stop by for a quick bite of tasty hot dogs, chilli pots and nacho’s. The surfs up in our new Coffee Shack where you can chill out, refuel and catch a coffee. Visit Naughty But Nice in Canada Creek where you can find a tempting mix of milkshakes, ice cream, waffles, and chocolate and toffee apples as well as hot and cold drinks a real treat on your day out! Freshly made donuts made right before your eyes, a perfect treat on your day out. THORPE PARK takes very seriously our responsibilities to provide visitors with a quality food offering, including a wide range of healthy options - all at High Street prices. We constantly review the menus in our outlets, and over the last few years have not only improved the quality of our visitors' traditional favourites - but have also invested heavily in developing new balanced meals and healthy snacks for all the family - available where you see our 'Healthier Choices' logo. This includes grilling or oven baking our meals rather than frying whenever possible; offering baked potato or salad alternative to fries on all main courses wherever possible; improving the content of our kids lunchboxes; and even providing free fresh fruit salad with children's meals in many of our restaurants. In 2008 we introduced many new options including a brand new range of delicious healthy kids meals developed by leading food and nutrition expert, Annabel Karmel, which contain fresh ingredients and vital nutrients for growing children. However, we never forget that most people visiting a theme park/visitor attraction such as THORPE PARK regard it as a one or two day 'treat', and we must ultimately allow our guests' to take nutritional responsibility for their own food choices while they are with us. After a thrilling day at Thorpe Park with your friends, you'll probably be ravenous! Head to the Glass House Restaurant and try my brand new range of nutritious and healthy kids' food. Tasty home cooked food but with a healthy twist - choose from Fish Pie, Mild Chicken Curry, Cottage Pie & Spaghetti in a Tomato Sauce. All meals contain fresh ingredients and vital nutrients for growing children - vitamins, iron and essential fatty acids (to make you big and strong)! These meals taste so delicious; it's hard to believe they are good for you too. Try them yourself, hands off Mum and Dad! Please visit my website www.annabelkarmel.comfor more information. If you are experiencing difficulties with your booking please call our Contact Centre on 0871 663 1673 (Monday - Sunday, 9am - 5pm). You can contact our call centre on 0871 663 1673 (Monday - Sunday, 9am - 5pm). Please note this number is for sales and trip planning information only. If you have a comment on your day please contact Guest Services at the address below. Recruitment enquiries please visit our Recruitment Website or call 01932 577 302. For all corporate event enquiries please visit our corporate website www.merlinvenues.com or email parkevents@merlinvenues.com. For Group enquiries please call 0871 663 4466. If you have a media enquiry, please use our Press Area. if you have a fundraising request please check our charity page for contact details.